It was an early rising for the 06:45 start of the race. I had a restless night and had taken some liquid nutrition about 02:00. Followed it up with some more at 05:00. For most of the day I would just be on fluids. My stalwart wife Lis was dressed for the day in her ‘Endurance Nation’ T-Shirt, with the cow bell she got at Ironman Louisville for noise effects. Here we are before the effort …. 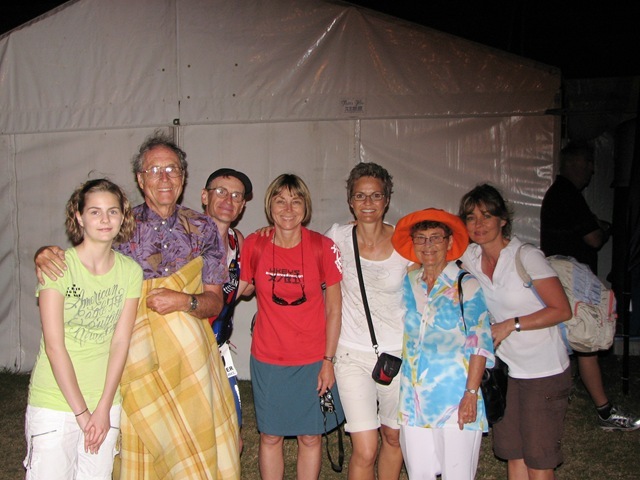 Our friend Anke and her daughter Alina w ere with us and we four headed down to the start in the dark. 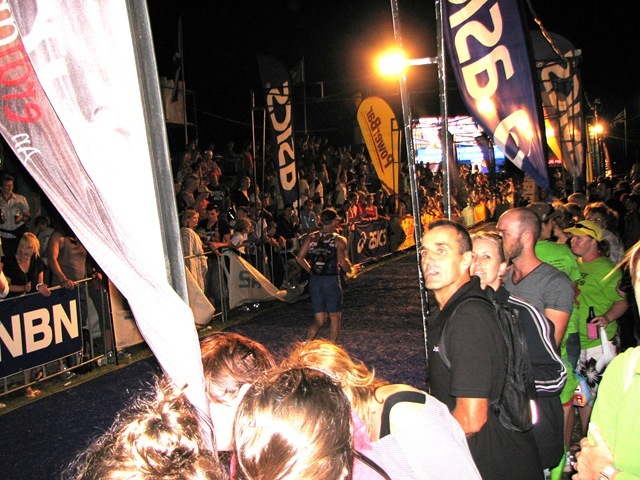 I always find it exciting to walk towards the transition area with the other athletes and supporters. There is an electricity in the air—the culmination of all of the hours of training and preparation has come down to this one day. My bike was very easy to locate as it was at the end of the rack. This of course meant that I had to run the entire length of the transition area with it during the race, but at least for once I would not have trouble finding it! It was unfortunately in an unlit corner, so after fiddling with my pump and not being able to read the pressure gauge I took the bike to the lighted area and got the tyres to the correct pressure. It was going to be a hot day and so I didn’t want to over-inflate them: a guaranteed recipe for getting a blow out. It would be very depressing to exit the water and have fix a tyre. We met up with my wife Lis’ parents and sister and then headed over to the river for the start. 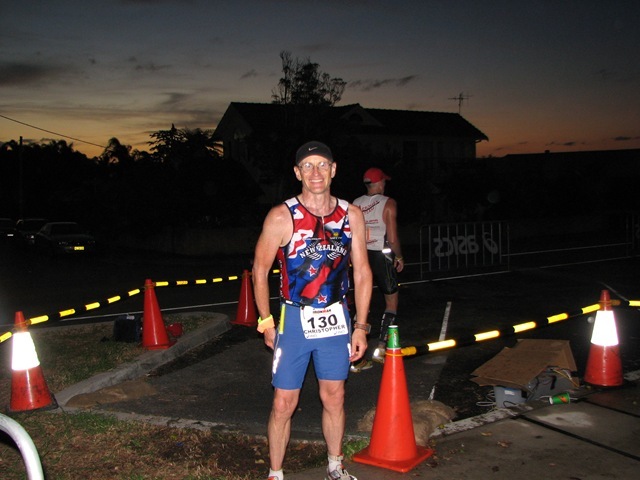 I was glad that it was a wet suit legal race because I always enjoy the added buoyancy which makes swimming easier. There were different coloured swim caps depending on your expected swim time. I was yellow since I am such a weak swimmer. To help control my normal enthusiasm during a race—namely going out too quickly—I stuck my ‘wetronome’ under my cap. This beeped at a regular interval and helped ensure I kept up a constant stroke rate. I had some problems with my goggle strap—which was exceedingly difficult to get right since I still had wetsuit lubricant on my hands—but which I solved using my teeth. Not a great start to the day. Soon the canon fired and we were off through the crazy melee of Ironman swimming. With 1500+ athletes fighting for the same space in the water there is always a lot of full body contact. My greatest fear is getting a kick in the face. It is a real possibility: my wife’s mother Anne told me that she saw a woman later in the day who she was certain had a broken nose from such contact. 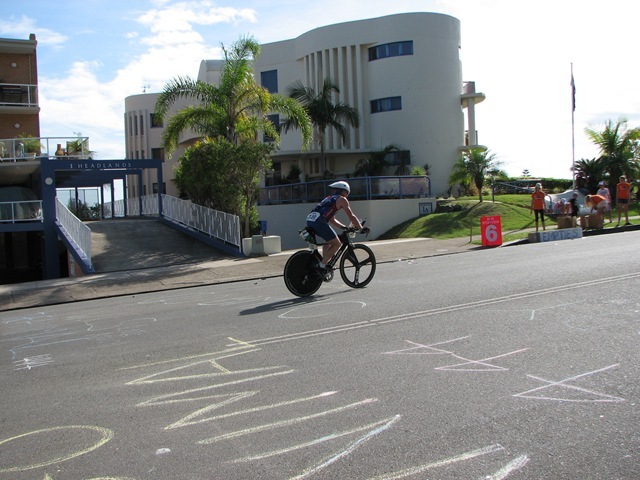 My friend Taneen broke a rib in Brazil (and still finished). Thanks to my wetronome I went out smoothly and didn’t go anaerobic. I gave as good as I got with the body contact. My swim coach Lionel had sent me a nice note before the race reminding me of what to do and I just focused on my breathing and stroke. 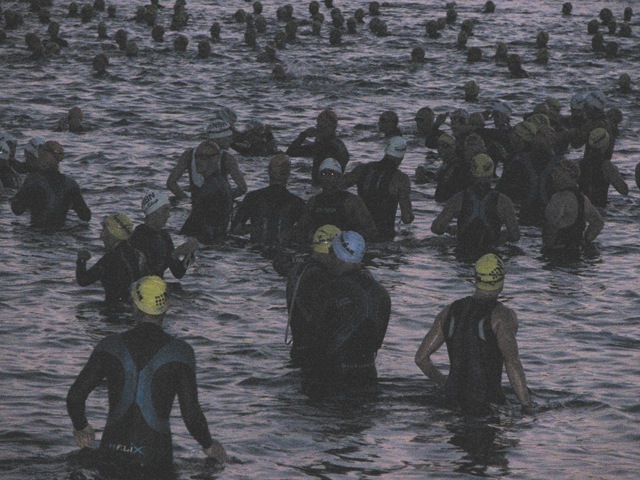 My goal was to swim straight (I usually wander all over the place) and keep good form throughout the 3.8 km swim. It was a two loop course and it was particularly nice not to have the sun in my eyes. I spotted regularly the buoys marking out the course and for about 3/4 of the swim I followed the buoy line very closely. The swim felt good and fast, and I was pleasantly surprised to be with people in white and orange caps who had put down much faster expected swim times. I was therefore pleasantly surprised to come out at 1:11, some 12 minutes faster than my other wetsuit race at Ironman Switzerland. While I was very pleased with the time, most people had fast swims, which made me think that either they mis-measured the course or there had been quite a current. Anyway, I’ll take the time and at least I kept good form for the entire swim. And didn’t get beat up. 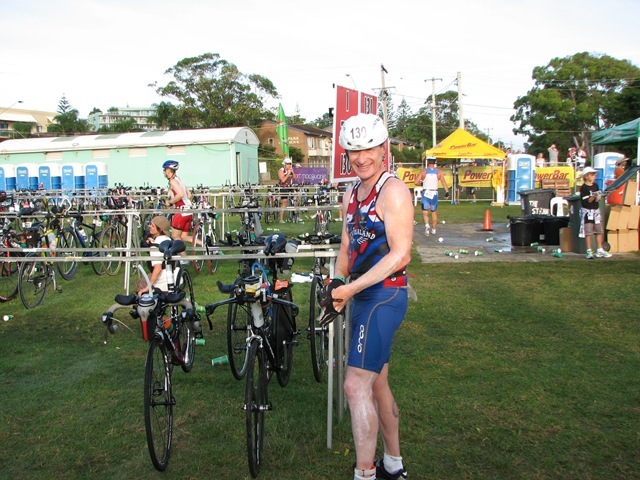 I had a good transition, and was grateful for the help getting out of my wetsuit. It is very difficult to do on my own and the volunteers in the changing tent were brilliant. I made sure to smother myself in sunscreen as it was going to be a boiler of a day. I found my bike without any problems—and was glad to see many other bikes still in transition—and was soon off on the 180.2 km ride. 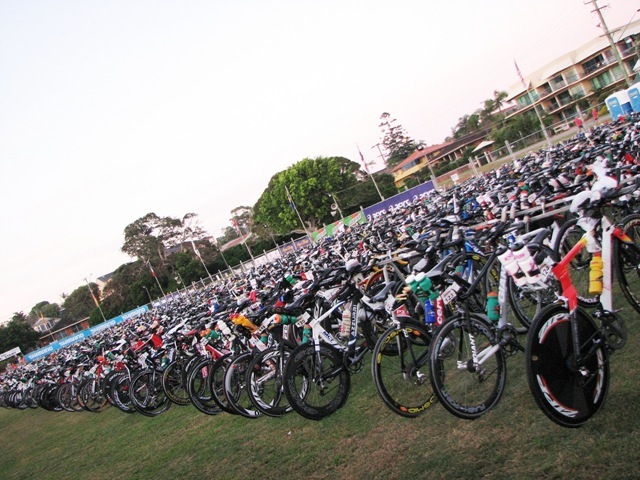 The key to a successful Ironman race is the bike. If you have a good bike, you will have a good run. There is no such thing as a good bike and a bad run. If you had a bad run, then you overdid it on the bike. Well, this was a day when my race plan went out the window and I had a very bad bike, predictably leading to an even worse run. The course was quite hilly for the first 5-10 km, then levelled out for a good run, before becoming hilly again to the turnaround. You had to do three circuits, each just over 60 km long. I found it very difficult to maintain my goal power on the hilly sections, as I had the wrong gearing on the bike for it. There was one very steep 10% section where I felt if I went any slower I’d fall over! On the flat straight section it went well and I was able to maintain my power and make good time, but other times I felt that I could not maintain my goal power at all. Very strange. It didn’t help that my shoulder was acting up—I had pulled a muscle three weeks before the race and the massage/physio had not completely solved the problem. I’d regularly have to get out of the aero position and stretch my shoulder to reduce the discomfort. On the positive side my new nutrition from Infinit worked really well and I was able to take nutrition for the entire ride. 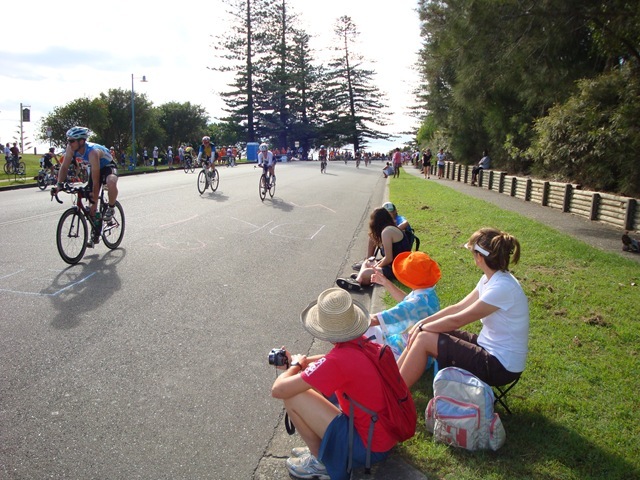 When driving into Port Macquarie we had taken the road we were to race on. 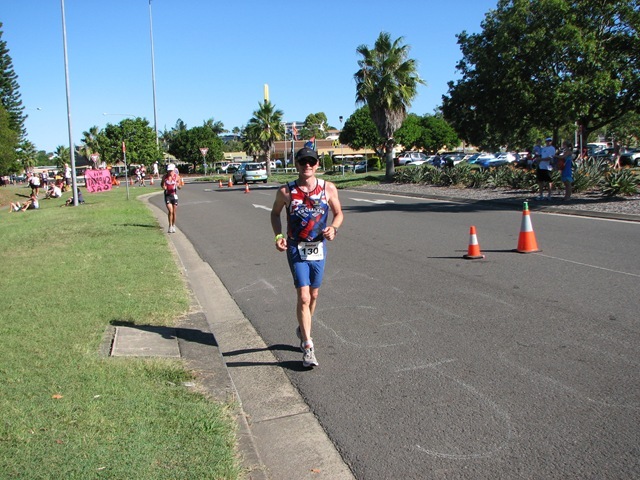 It was in very poor condition so I had decided not to run with my race tyres but instead to use my training tyres. Good call. There were countless people with punctures along the route. It got particularly bad along the road towards the turnaround where the pavement was so bad that people had lots of things falling off their bikes. I could have opened a shop selling water bottles, CO2 cartridges, spare tyres, tool bags, etc. collected along this road. It was very hard work and I managed a 2:04:30 for the first leg, followed by a 2:06:44 for the second. The family were on the hill a few kilometres from transition making lots of noise. I had to stop and get some outside inspiration from my wonderful wife. A cheeky spectator called out “I think that’s outside assistance which is not allowed”. After 22 years of marriage it is very allowed. At the bottom of the hill on the third leg some fellow hit my rear wheel with his front one. I called out ‘nice driving’ but felt bad because it looked like he had actually knocked himself off the bike. At least he didn’t take me down with him!By this time the wind had come up and I positively flew through the first 30 km, but guess who had a strong headwind on the way home? It was grim and I only managed 2:13:23 for that leg. 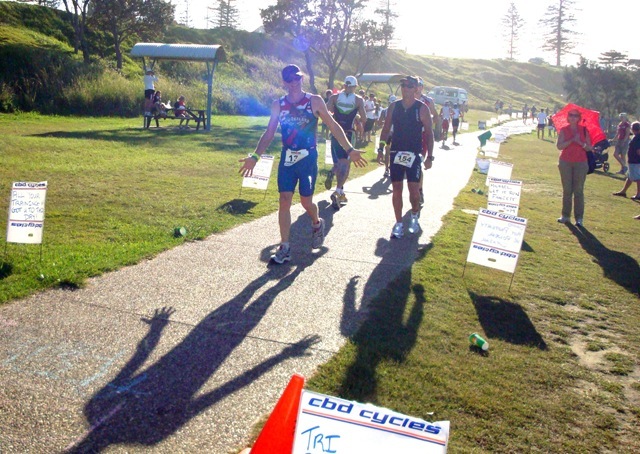 I felt like I was at Kona in Hawaii with the strong, hot headwind. 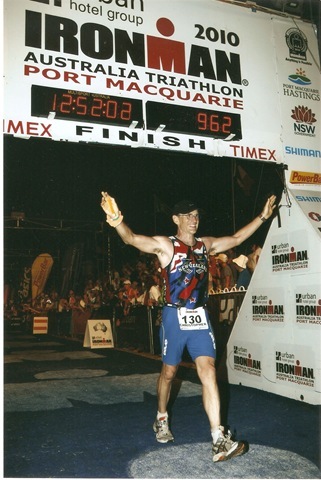 Was I ever glad to get off the bike and start the run … the problem was, that I had worked far too hard on the bike and I would now really pay for it. One of the advantages of racing with a power meter is that you know just how much work you’ve done. There is an excellent table called “Fatigue Loading Scores for Ironman Racing”, subtitled: “How tired do you want to be when you get off the bike”. During my race preparation I had targeted a training stress score (TSS) of 286, based on my previous races and my perceived fitness. Unfortunately, when I got off the bike my TSS for the ride was a whopping 333. What does this mean? A TSS of 286 would in theory allow me a decent run. 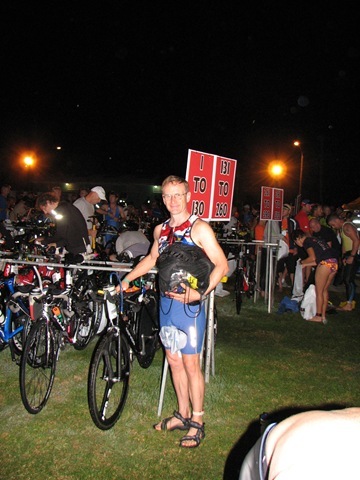 It did last year at Ironman Louisville. A TSS up to 302 is for “massively prepared … proven strong IM runners”. I am neither. A TSS up to 320 means “run a few miles then walk it in”. And for me, with more than 320? “You blew it. Try again next year”. That is an understatement. Had another quick transition and was out for the run. Was great to finally be off the bike and stretching my legs, which felt surprisingly good. 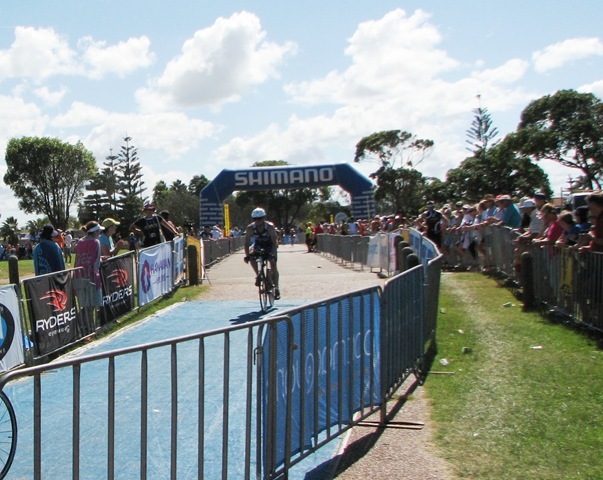 The run was another three lap course, with 14 km per lap. It headed out to the north for 3.5 km, then back to the transition area, before heading along the coast and then up some more cursed hills for another turn around. At least with a route like this there were always people around. It was great to have the family here supporting me. Lis, her sister Laila and friend Chris positioned themselves to the north, Lis’ parents near transition, and Anke with Alina were at the beach before the hills. I felt quite good for the first 10 km, and was consciously trying to hold myself back and run my goal pace of 6:00 min/km. My ‘target’ pace was 5:40 and you always try and run a bit slower for the first hour so that you still have something in the tank for later on. As you can see from the photo below, it was a brilliant sunny day, with the temperature just pushing 30 C (about 85 F), and high humidity which are not the best conditions to run a marathon, especially for a Canadian! I became very overheated and found it quite disconcerting that none of the aid stations had any ice. A real oversight. Not even the medical tents had any. At one point I ran off the course and dunked my head in the ocean to try and cool down. All I got was an extra dose of salt because the water wasn’t that refreshing. Sure enough, the combination of the heat and blowing the bike ride took its toll so I ended up doing the old marathon run/walk combination. That is where you run a certain distance, then walk a bit. At least I wasn’t alone, in fact there were more walkers than runners at time! I was very gratified to find that some spectators were providing ice to the runners. The fact that my sister-in-law was one of them is not a sign of favouritism. Technically, we are not allowed any outside help but there was an official who said not to worry about it since there was none at the aid stations. That assuaged my conscience. With ice under my hat, down my shirt, I felt much better, although my shoes were soon very sodden and weighted down by all the water. I had a nice inspiring short run with Anke up one of the hills, she was such a great sport. But the real sport was the old fellow doing the marathon with his arm in a sling and a bleeding knee. Obviously he had crashed his bike, but he wasn’t going to let that stop him. The day progressed and soon turned into night. We had a very nice sunset and I was grateful that I was on the final leg of a long day. I had hurt the muscle in my left leg quite badly about two weeks before the race and had been getting massage and physio on it. It was good for most of the race and only announced its presence during the last 10 km or so. Hey, it could have been much worse. Up the hill for one last time. It was a very pleasant surprise to find Lis, Laila and Chris at the final run turnaround point where they grabbed the photos below. I was still running, and even smiling! From here it was about 4.5 km home, much of it downhill. I ran most of it then about 1 km from the finish I got some really wicked pain in my side, as if someone was putting a knife into me. Had to stop and apply pressure for a bit before running on again. This was very unusual since normally I am so pleased to be in the last leg of the race that I do really well. Not tonight. I probably stopped six times in that last kilometre. 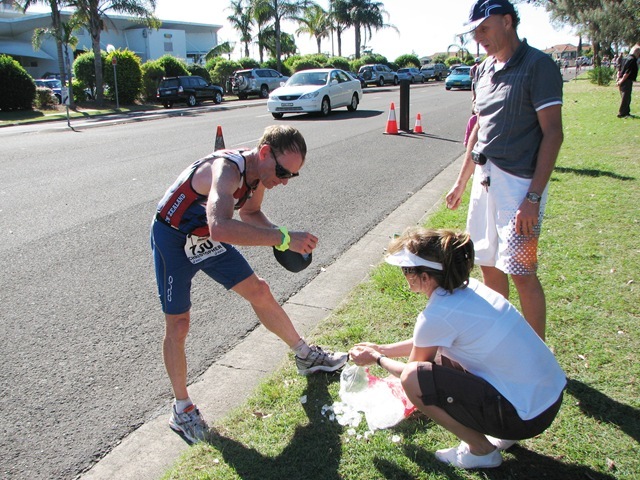 At one point some concerned spectators asked if I needed help, but I declined—I was almost there. Once I got to the point where I could actually see the finish I just focused on that and soon I was running down the chute which is an experience second to none. It was great to see the family, Anke and Alina as well. Made it all the more special. I was really surprised to find that my run was above average, and I came 49/112 in my age group. At least I wasn’t the only one to suffer! My final time was 12:52:03 and I place dead in the middle of my age group at 56. Not bad with less than two months training and a couple of injuries. Still, I wish I could have done better on the bike but I’m not sure how I would have kept my TSS lower with such conditions. No medical tent for me this race. I went into the finisher’s area and grabbed a massage and then some ice cream, before meeting up with Anke and Alina. We then got the family photo below. I grabbed my gear and we headed back to the hotel. I rode my bike—easier than walking—and was scoffing food by the time the others arrived. Slept really well that night, in spite of the aches and pains. 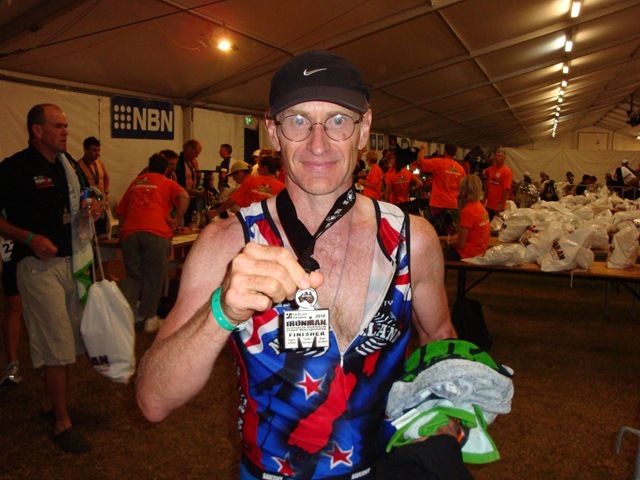 So four Ironman races down and two more to go. At least nothing else is planned for 2010 so I’ve a break ahead of me. 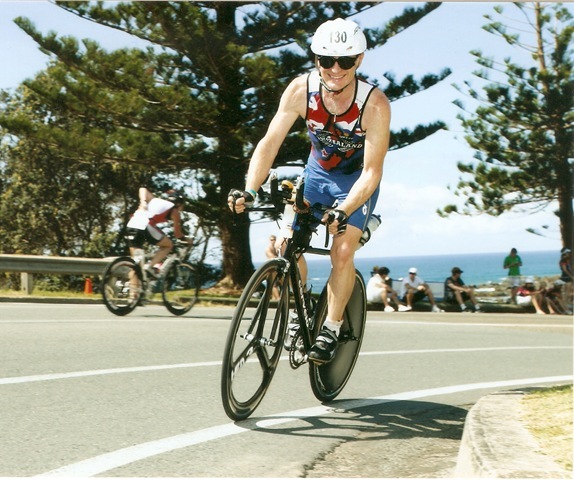 May race a few half-Ironman races but I really want to focus on improving my cycling. 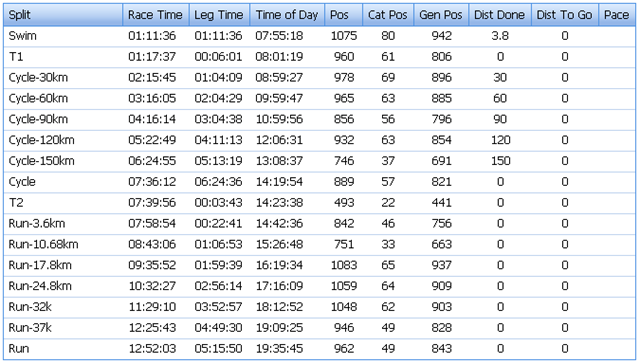 Here are my final splits for the race. Congratulations Chris!! 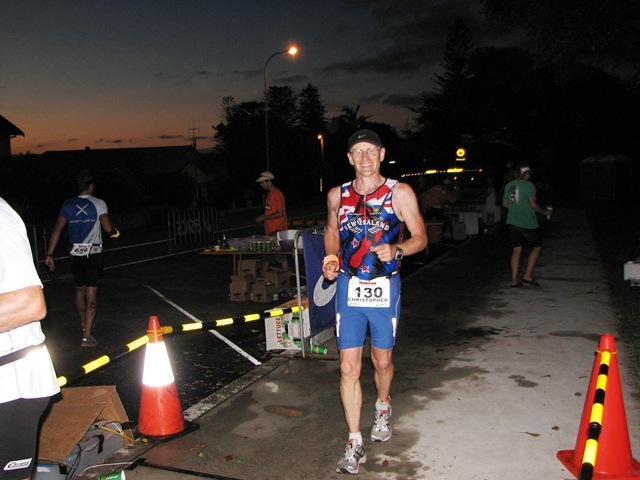 You sported your true Ironman grit as always — way to go. And I have to give a shout out to Lis. It was fabulous to see her and all of your family/friends there as well. 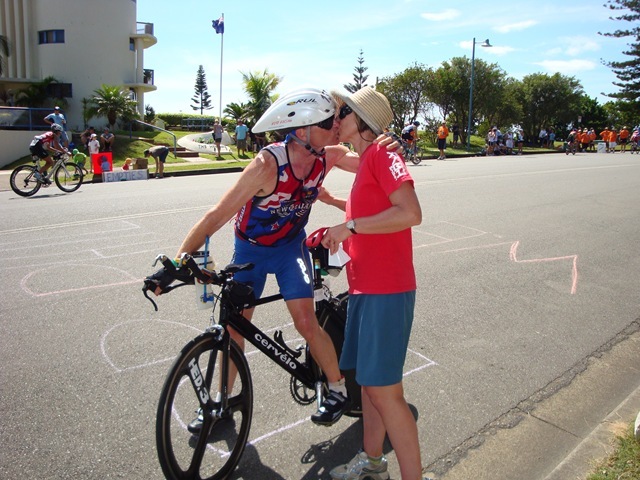 The kiss on the bike — priceless — for all who know what this journey of Ironman racing has been for you both. hey chris, been following your blog and enjoyed the race report. great finish and keep going! Amazing experience!!!! I am so happy Alina and I were part of this. Very inspiring , I loved every minute of it, as did Alina. When you come to Vancouver, lets ride bikes together and talk more IRONMAN!!!! Thank you for sharing this, look after yourself now!! !